Who'd have thought Dolly Parton lyrics could prove so meaningful? The last time we saw "The Orville," Lt. Gordon Malloy (Scott Grimes) experienced life in 2015 after a time capsule was discovered and Lt. Cmdr. Bortus (Peter Macon) became addicted to cigarettes in the episode "Lasting Impressions." With the occasional exception, each installment of "The Orville" tends to focus on one particular member of the main crew and one thing that hasn't done the show any favors this season is the running order of episodes. We've had a couple that focus on Bortus close together and then, after waiting 22 episodes for just one that focuses on Malloy, two came along in succession. Moreover, this latest installment, entitled "Sanctuary," is yet another that focuses heavily on the all-male Moclan culture; that's four episodes this season, out of 12 so far. This uneven distribution needs to be addressed for Season 3. 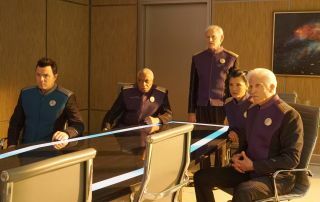 All that aside, it's good to see the crew of the USS Orville on our screens once again after its three-week break. If only there were more than two episodes left in this season. We find the USS Orville is undergoing a weapons upgrade and has picked up two Moclan engineers who want to be taken to another nearby planet. If this sounds a little familiar, a similar series of events happened just five episodes ago in "Deflectors" (S02, E07). Then, the passenger turned out to be an ex-boyfriend of Bortus — with a culturally taboo secret — which caused more than a little friction between Bortus and his mate, Klyden (Chad L. Coleman). This time, Toren (Shawn Andrew) and his mate Korick (Regi Davis) temporarily join the Orville crew. However, once Lt. Talla Keyali (Jessica Szohr) has shown the newcomers to their quarters it quickly becomes clear that not all is as it seems. Again. They appear to have smuggled something on board, and as they open the large container, away from the camera, both Moclans are bathed in the glow of whatever it contains. What could it be? A primetime Emmy? The soul of Seth MacFarlane? The Ark of the Covenant? At which point the opening credits roll, so we'll just have to wait a little bit longer to find out. We cut to the small, scaled-down school on the Orville, where "Star Trek: The Next Generation" alumna Marina Sirtis is teaching the very young children. It's great to hear her talking in something more closely resembling her native north London accent, rather than the ghastly one she had to use in "Star Trek." Funnily enough, this episode was directed by Jonathan Frakes — Sirtis' on-and-off love interest in "The Next Generation" — so one can only imagine the shenanigans that took place off-camera while making this episode. Topa (Blesson Yates), the son of Bortus and Klyden, seems to have rapidly grown. In the space of what can only be a year and a half of elapsed time in the show, he seems to be about 8 or 9 years old in Earth time now. He's also developed something of an attitude: We see him bullying a smaller, female, pupil. It seems Klyden has been instructing young Topa that females are inferior, as is the Moclan way, much to the disgust of Bortus … and so the main story arc of this episode is set up. Isaac (Mark Jackson) detects a large energy drain coming from the quarters of the Moclan guests, so Bortus is sent to investigate. He is shown the container and its precious cargo — it's a Moclan baby girl, in stasis. Toren and Korick are attempting to smuggle her away from Moclus and they beg Bortus not to reveal anything. He agrees: Based on his own experiences and the subsequent trial involving his own child seen in "About a Girl" (S01, E03), he is sympathetic to their situation. In an effort to change his son's prejudices, he later brings Topa to their quarters to show him that Moclans, too, can be born as girls. This is a shockingly bad decision, which is shockingly obvious. Still, you can't blame Bortus for trying to do the right thing. Despite promising not to say anything, Topa naturally tells Klyden what he's seen, but, thankfully, not before Toren and Korick depart the Orville on their scheduled shuttlecraft flight. Nonetheless, once news of what's happened reaches Capt. Ed Mercer (Seth MacFarlane) and Cmdr. Kelly Grayson (Adrianne Palicki), it escalates to an official Planetary Union matter. The Orville sets off to track the shuttlecraft, which brings the crew to a small star system, hidden inside a nebula. Orbiting this star is a habitable world where an exiled colony of some 6,000 female Moclans lives, led by Heveena (Rena Owen), the legendary Moclan woman we were first introduced to in "About a Girl." She explains that the Moclan government is lying about the number of women born: There are many more than officially recorded, but only a few are able to escape to this sanctuary. Naturally, this creates a serious diplomatic situation. Heveena asks Mercer for asylum and asks that he bring this case before the representatives of the Planetary Union. However, the Moclan government is not at all happy and insists these females are fugitives that need to be taken into custody immediately. The issue becomes political because the Planetary Union relies on Moclan-designed weaponry, which is more important than ever following the Kaylon attack a few episodes prior. Moreover, the Moclans threaten to withdraw from the Planetary Union should the colony be granted sovereignty. Mercer returns to Earth with Heveena to join Adm. Halsey (Victor Garber) in addressing the members of the Planetary Union — imagine the senate in the "Star Wars" prequels meets "A Few Good Men." There's a great cameo by F. Murray Abraham here as the Chairman of the Union. During her visit, Heveena discovers Dolly Parton and dubs her "a great Earth poet" in the vein of typical MacFarlane humor and this episode's only real comic relief. Meanwhile, back in the nebula, a Moclan battlecruiser has arrived, prompting a brief stand-off with the Orville. But soon, the Moclans break the impasse by launching three shuttlecraft to apprehend the so-called fugitives. Cmdr. Grayson (Adrianne Palicki) and Lt. Cmdr. Bortus (Peter Macon) ready themselves to defend the exiled colony of Moclan women. This starts a simultaneous three-way fight: one on the surface of the planet, one between the Orville and the Mochlan ship in orbit, and one in the giant council chambers of the Planetary Union. There's some well-written dialogue as Mercer and the admirals of the Union contemplate every angle of the dilemma. "If we don't stand up for the values that this union was founded on, what exactly are we defending?" Mercer asks. Our only minor quibble is that all the Union admirals in this scene are human; it would've been nice to see at least one alien admiral involved in this high-ranking decision-making. Grayson requests advice on how to proceed and is told officially to stand down, but unofficially to get down to the planet's surface and get involved. Bortus insists on coming with her and what follows is an entertaining sequence with the two of them running around blasting Moclan troops (weapons set to stun, naturally) as Dolly Parton's anthem to the workplace grind, "Nine to Five," plays. This is more or less what happens in the beginning of "Deadpool 2," which raises the question, is this a respectful homage, or a surreptitious steal? When does one become the other? Perhaps Frakes didn't see that movie. There is, however, a brief-but-brilliant, Christopher Nolan-style visual effects shot from the point of view of one of the main guns on the Moclan battlecruiser firing at the Orville. More of that creative camera work, please. After a stirring speech by Heveena — including an interesting interpretation of the lyrics of "Nine to Five" — the Planetary Union decides that the colony will be granted protection, but not sovereignty. This means the 6,000 or so Moclan women are safe, for the time being, but that the secret underground routes which they used to escape Moclus without detection have been compromised. It's not a victory, but it's not a failure. The episode offers a commentary on the issues of cultural tolerance and moral responsibility, as well as personal freedom and contemporary awareness. Heveena remains optimistic and vows to continue the struggle. While "Sanctuary" acts as a sequel-of-sorts to the events of "About a Girl," it is also in essence going over the same ground — and ground we will no doubt return to in Season 3. The continuing theme will undoubtedly polarize viewers, with some heralding this as a follow-up and others saying it's simply repeating what's already been said. You may remember, we learned in "Primal Urges" (S02, E02) that the Moclan method of beginning divorce proceedings is to murder your mate. Fingers crossed, then, that Bortus plunges a dagger deep into the chest of Klyden before the end of the second season. He's got two episodes left to do it. Season 2 of "The Orville" is on Thursdays at 9 p.m. EDT on Fox in the U.S. It can be watched on demand on Fox Now and Hulu. It's also available on Fox.com in the U.S. In the U.K., it's on Thursdays at 9 p.m. GMT on Fox. The first season of "The Orville" is available to buy on DVD and a season pass can also be purchased from Amazon.